Looking For The Best Powered PA Speakers for the Money? Getting a high quality powered PA system should be considered an investment, not a purchase. Quality equipment will cost a little more, but it’ll work consistently, last longer, and eliminate much of the stress and headaches that come with cheaper systems. 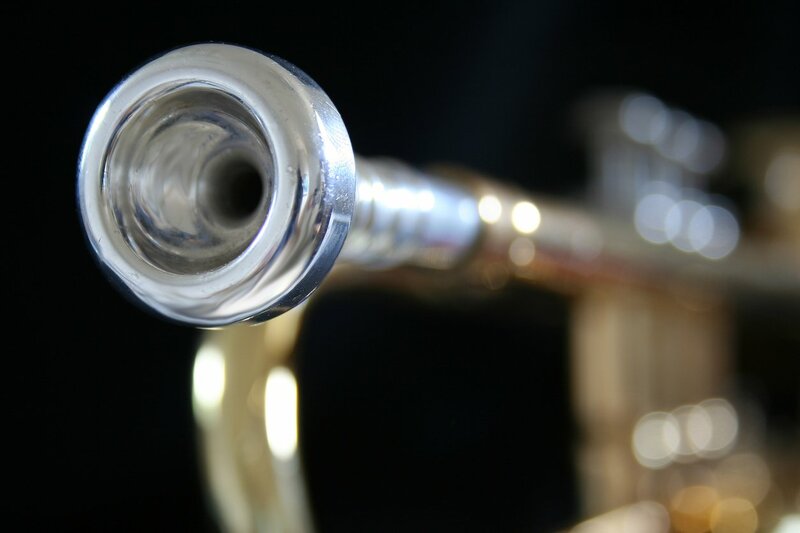 Fortunately, there are plenty of great options that offer professional-grade quality at an attractive value. How big and how many – how large is your average venue? Is it a wide-open multi-story room, or does it have a standard-height ceiling? How deep is the room? Will you be outdoors or indoors? How many people will be there? How far away will the audience be from the stage? You don’t need to get into the math of acoustics here, but it helps to have a rough idea of how much sound you’ll need. Powered or unpowered – given the name of this article we already know the answer to this question, but I’ll list it anyways. Powered speakers offer the convenience of plug-and-play without needing to lug around an entire system. Passive speakers will require an amp and possibly other pieces of equipment to function optimally, but if you’re running a budding production company, you might prefer a flexible, modular setup with some passive speakers. Having enough power – the great thing about powered speakers is that you don’t need to worry about matching an amplifier to the speaker. 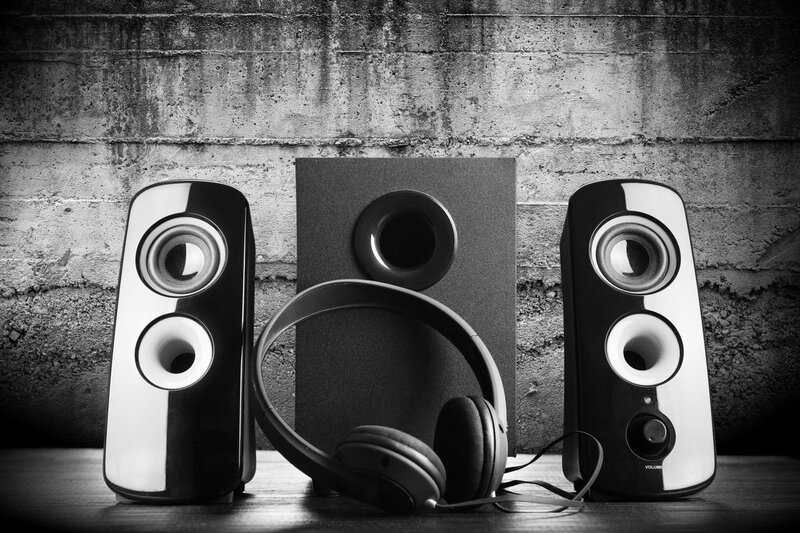 If you’re using passive speakers, having too much or too little power can damage your speakers. 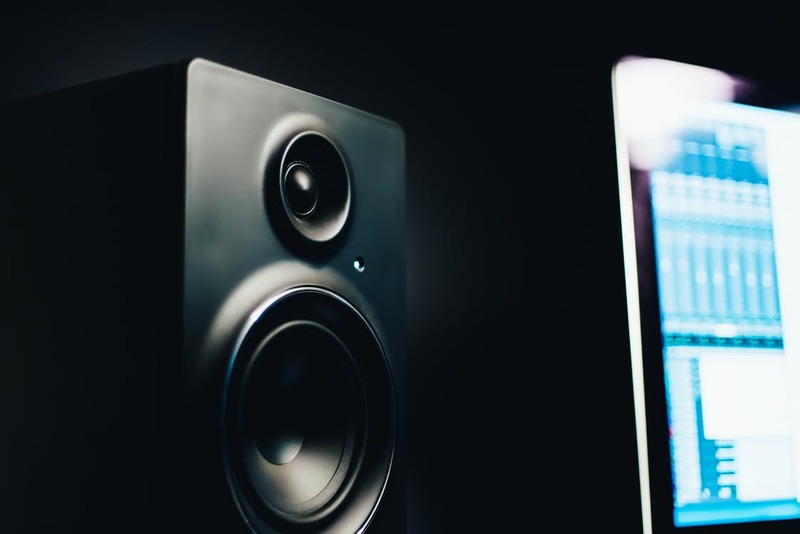 Using a subwoofer – generally speaking, using a sub-woofer will make music sound much more rich and vibrant by maxing out the full range of sound. That said, there are certain situations where the difference is hard to detect and therefore not worth the extra investment. 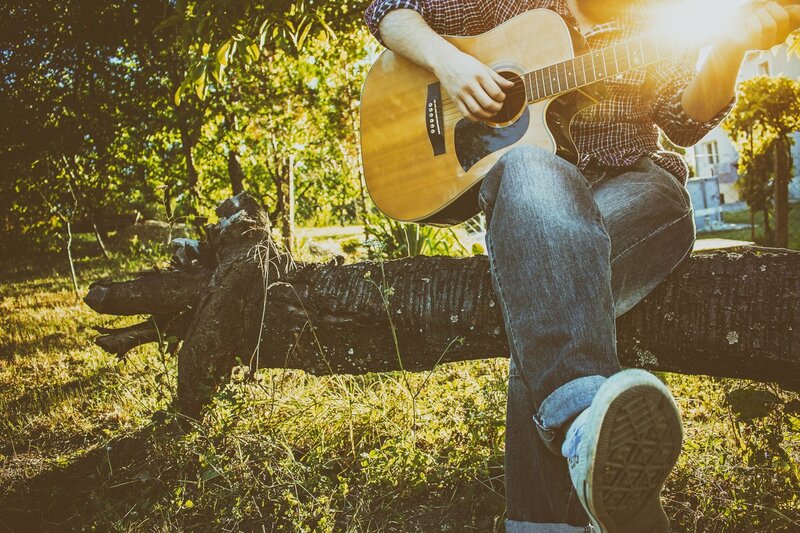 If you’ll be using your PA system for speaking or acapella singing, or if you’re performing in very small spaces, the benefits of adding a subwoofer will be negligible. The ZLX-12P is compact, lightweight, and engineered to provide power and performance significantly beyond other small format loudspeakers. 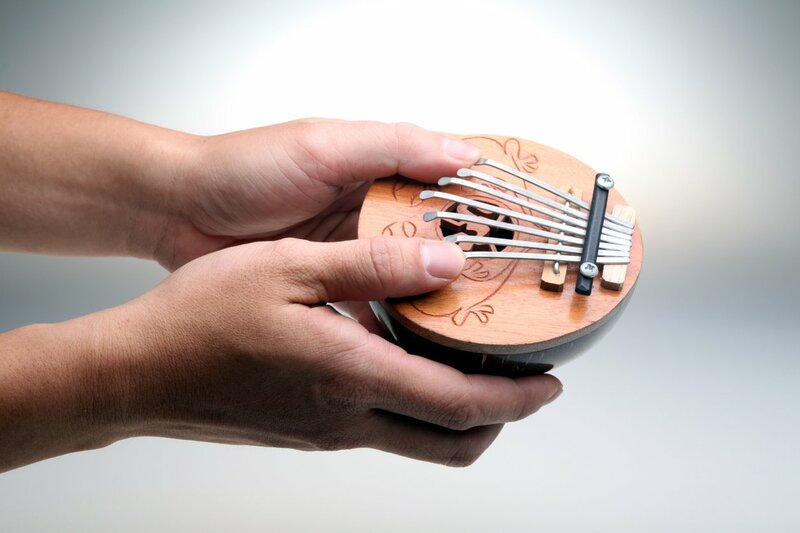 It accomplishes this with a patented split-baffle design for superior driver time alignment, and input level meters and independent amplifier control to ensure optimal gain structure. 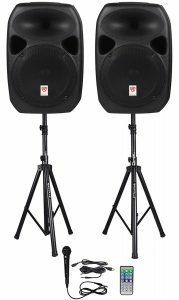 Its size makes it ideal for sound-reinforcement and stage monitoring in smaller venues, and high/low grip design makes it easy to mount on a pole. Pound for pound, this is the best composite box on the list. If you’re looking for an all-in-one out of the box solution, this is the one for you. 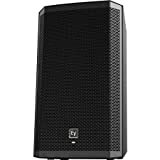 The PARTY 15 system comes with 9 components: an active speaker, a passive speaker, a wired microphone, a wireless remote control, a 30-ft speaker cable to connect the passive speaker to the active speaker, a power cable, a microphone cable, and 2 speaker stands. The active speaker has a built-in amp that magnifies the audio signal, and its wide frequency response (from 50-20KHz) makes it suitable for amplifying any type of audio. The passive speaker (which is powered by the active speaker) features a high quality 15-inch woofer with a 45oz magnet and high-efficiency tweeter, which come together to produce a full-range of sound. The speakers also have built-in LED lights for fun lighting effects. The RPG-122K is another fantastic all-in-one out of the box solution. The system comes with two 12-inch professional audio speakers (1000 watts), one of which is the master active speaker with a built-in amp, and the other is a passive speaker powered by master speaker’s amp. You’ll also get two speaker stands, a microphone, and all of the necessary connection cables. The system has Bluetooth integration, a USB input, SD card input, and preset digital graphic equalizer effects, with a wireless remote control. The woofers have a 30oz. magnet and high-power aluminum voice coils, and the tweeters boast 25mm Piezo crystal compression horns for crystal-clear loud highs. The ABS plastic polymer cabinet is time-aligned with the drivers, so the system is optimized to deliver an insane amount of bass, clean mids, and clear highs. The active speaker unit features a Clip LED indicator to let you know when you are starting to distort, so you can always retain control of the music. Separate bass and treble controls are included to help you customize your sound stage, and there is a built-in equalizer to help you tailor the sound to the style of music you’re playing. The Pyle Powered Loudspeaker is an active powered speaker that offers a bit more of a bargain than the ZLX-12P that we discussed earlier. It functions as a two-way loudspeaker, and comes loaded with plenty of versatile audio streaming features. You’ll enjoy a durable and reliable sound performance with a built-in area projection subwoofer, high-frequency tweeter, and an integrated digital audio processing amplifier. The speaker is housed in a heavy-duty ABS cabinet with a protective metal grill to provide solid and fortified sound in any environment. 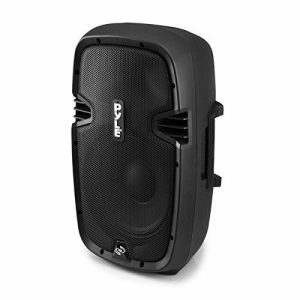 If you’re looking for the best value for a single powered PA speaker, this is the one for you. The SPA-8 is a one-speaker, one chord solution that eliminates the need to lug around an entire system. 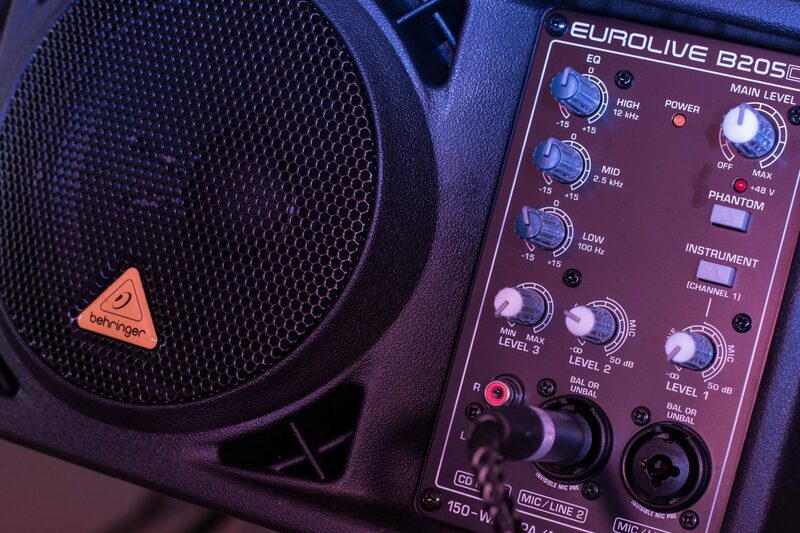 It’s compact with a built-in 100-watt amp, so it’s ideally suited for smaller venues and professional presentations. The SPA-8 has flexible inputs, reliable output, enough juice to crank the volume, simple music controls, and quality audio reproduction. 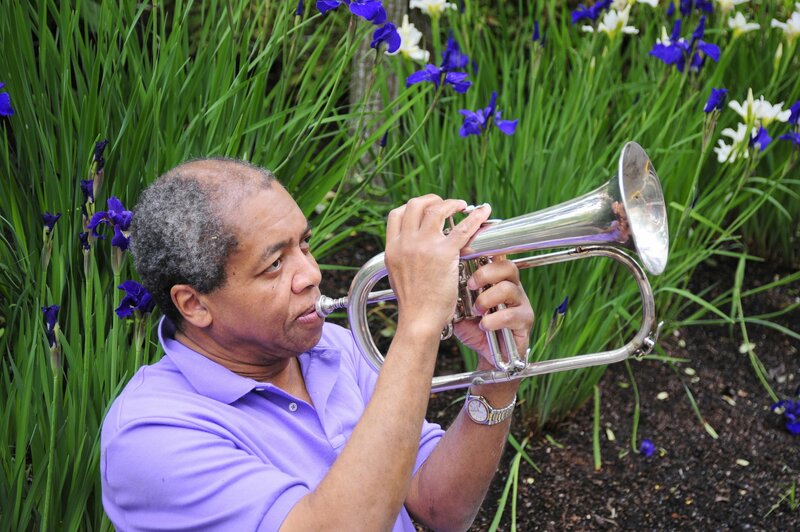 With its light weight and take-me-anywhere size, it’s the ultimate solution for portable yet powerful amplification. 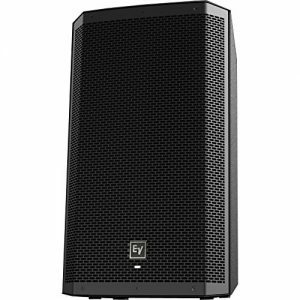 If you’re looking for a professional-grade powered PA speaker and you have some wiggle room in your budget, the Electro-Voice ZLX-12P is hands-down your best option. 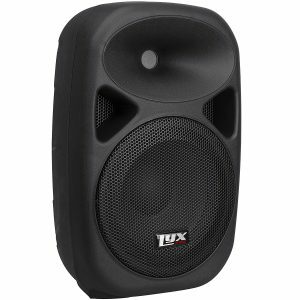 If you’re looking for a compact speaker for smaller venues, then the Pyle Powered Loudspeaker and the LyxPro SPA-8 are both excellent values. 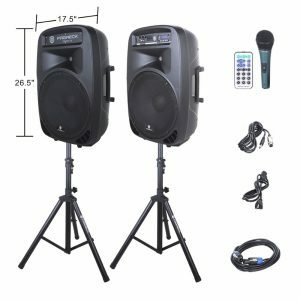 And if you’re one of those people who just want to purchase an all-in-one solution where you get the entire PA system out of the box, I’d highly recommend considering the Proreck PARTY 15 and the Rockville RPG122K—both are priced competitively, and offer the reliability and durability you’ll need to make this investment last a very long time.